14K Yellow Gold Bezel Round Pink Tourmaline Leverback Dangle Earrings 1"
The cute pink color sparkles brightly as the round tourmaline gemstone is cradled in bezel setting. These cute dangle earrings are crafted in 14K solid yellow gold and secured with lever backs. Pink Tourmaline. When miners first found these gemstones, they thought they were real diamonds. Latching leverback wires keep them safely in place for you. The middle gemstones are genuine Czech Moldavite. The Moldavite miners can't wait: They hand dig holes in the ground, just big enough for themselves and their ladders, and sift through the mud in search of this beautiful and rare tektite. 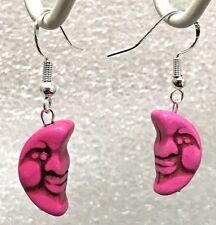 NEW 925 Sterling Silver Pink Turquoise Magnesite Moon Face Hook Earrings 1.5"
NEW Beautiful Handmade 925 Sterling Silver Turquoise Magnesite Moon Face Style dangling hook earrings. Gift box ready! Every Pair is Unique ~ Genuine Lapis Lazuli with Crystal and Pyrite Inclusions. The Ear Wires Sterling Silver plate. Contains small parts ~ keep away from children. A Photo with a coin has been provided to show the scale. Muonionalusta is located north of the arctic circle in Sweden. Latching leverback wires keep them safely in place for you. These small, lightweight earrings are sterling silver. Different angles of light make them look lighter or darker gray. Genuine Ruby. The Ear Wires are Stamped. 925 SOLID Sterling Silver. This contains small parts ~ not for use by children. Colors may vary ~ a scale picture is shown. There are superb, sparkly, rich green, faceted Czech Moldavite gemstones in these hand set earrings. 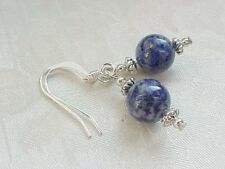 The artisan earrings in the photos are the exact earrings you will receive. Hallmark: . 925. The earrings in the photos are the exact earrings you will receive. Latching leverback wires keep them securely in place for you. The earrings in the photos are the exact earrings you will receive. 14K -. 585. Sample image Count: 24 stone(s). Liberty Pawn & Gold is owned and operated by Dave and Tammy Munsee. Dave is from Richmond and Tammy was born in Fredericksburg, VA. They have been married for 35 years and have a son that attended Fredericksburg Christian School, Riverbend High School and recently graduated from West Virginia University. Latching leverback wires keep them securely in place for you. Long dangle earrings are solid sterling silver and are set with genuine Czech Moldavite. The Moldavite miners can't wait: They hand dig holes in the ground, just big enough for themselves and their ladders, and sift through the mud in search of this beautiful and rare tektite. Latching leverback wires keep them securely in place for you. Genuine Czech Moldavite is set in these sterling silver earrings. The Moldavite miners can't wait: They hand dig holes in the ground, just big enough for themselves and their ladders, and sift through the mud in search of this beautiful and rare tektite. • Star Dangle earrings. • Sterling Silver. • Green Crystal accent. 925 Sterling Silver Multi Stone Concho Sun Design Drop Earrings. They are very Sparkly! A lovely Gift idea! If you are outside. Showing signs of age, wear or a hairline internal crack in a stone may be visible. These are natural signs of age and should be expected. Latching leverback wires keep them safely in place for you. Fabulous, luminous natural green Labradorite is set in solid sterling silver. 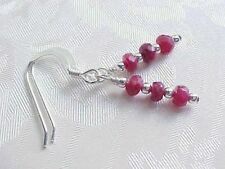 The one of a kind earrings in the photos are the exact earrings you will receive. 1 Solid Sterling Silver 925 Circle Dangle Earring with CZ - Single Earring ONLY! Single earring only. Used piece that is scratched and tarnished. This 925 sterling silver circle earring has a CZ Stone in the center. With also 925 ear wire with ball end. This is a thick little piece, and just under 1/2” wide. This can also be turned into a pendant by just pulling off the ear wire. Would look nice on a charm bracelet too. Shipped with USPS First Class Package from California. A Need For Beads design, these earrings are charms made from 14kt gold-filled French wires, sterling silver halo, gold wings, along with a malachite stone bead for the angel's head. The skirt is Czech glass with a marea finish. • Sunstone accent beads. • Binary Stars Dangle earrings. • Sterling Silver. • Sterling Silver ear wires. VTG "AMAZING COLOR" AMETHYST And SILVER DANGLE DROP EARRINGS "NEVER WORN"
Bali Legacy Indian BLACK STAR DIOPSIDE EARRINGS in 925 Sterling Silver 3.40 Cts. 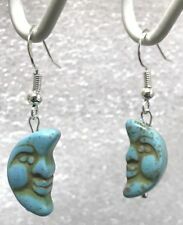 NEW 925 Sterling Silver Green Turquoise Magnesite Moon Face Hook Earrings 1.5"
NEW 925 Sterling Silver Orange Turquoise Magnesite Moon Face Hook Earrings 1.5"